Since July 2010, TNBBC has been bringing authors and readers together every month to get behind the book! This unique experience wouldn't be possible without the generous donations of the authors and publishers involved. It's the first of the month and you know what that means. It's time to bring you August's Author/Reader Discussion book! Did I happen to mention that is my favorite book of 2014?! I cannot wait to hear what you guys think of it! This giveaway will run through July 8th. Winners will be announced here and via email on July 9th. 1 - Leave a comment here or in the giveaway thread over at TNBBC on goodreads, stating why you'd like to receive a copy of the book, what format you prefer , and where you reside. Remember, only US residents can win a paper copy!. If you are a US resident, and prefer paper, please also list your consolation digital format (because there are only 3 paper copies available). ONLY COMMENT ONCE. MULTIPLE COMMENTS DO NOT GAIN YOU ADDITIONAL CHANCES TO WIN. 2 - State that you agree to participate in the group read book discussion that will run from August 18th through August 24th. Eric Shonkwiler has agreed to participate in the discussion and will be available to answer any questions you may have for him. *If you are chosen as a winner, by accepting the copy you are agreeing to read the book and join the group discussion at TNBBC on Goodreads (the thread for the discussion will be emailed to you before the discussion begins). 3 - Your comment must have a way to contact you (email is preferred). I'd love to win this book because I never get enough post-apocalyptic fiction. Also, I start college in September and won't have as much time to read, so I'm devouring books like crazy. I agree to read the book and to participate in the goodreads discussion. I prefer epub. Mobi is an okay second choice. I would love to read his book, sounds like a good one. I also like participating in book clubs, its always nice to hear others opinions on a good read. I read anything you put in front of me, right on down to the cereal boxes as I eat. I would love to receive a copy of the book (hardcopy is preferred because I love the feel of a real book but I have plenty of love for electronic as well) because it sounds like a great read...much better and certainly more interesting than the pablum I have been mindlessly reading recently. 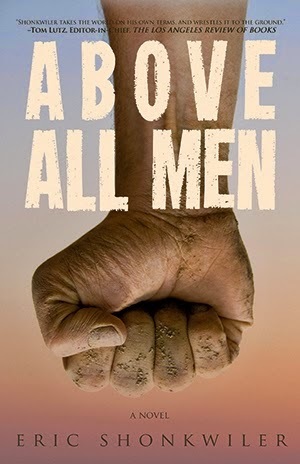 After reading Schuler Benson's recent review, I put "Above All Men" on my to-read list. Would live a paper book or a kindle version. pbhusa@gmail.com Thanks! Thanks to everyone who commented to win. Unfortunately, many of you are missing required information - such as which format you'd prefer and/or where you reside (us or non-us), especially if you are requesting print. So it is with a heavy heart that I announce only one person from this thread will be winning a copy of ABOVE ALL MEN. DogBoiJoe... congrats! An email is heading your way! For those of you who commented and didn't win, we'd still love to see you over at the discussion thread in August! And please comment again on future monthly giveaways (with all the necessary information!) I want to see you walk away winners too!!! !